A most unusual image today from the lens of Elinor and Reginald Wiltshire. 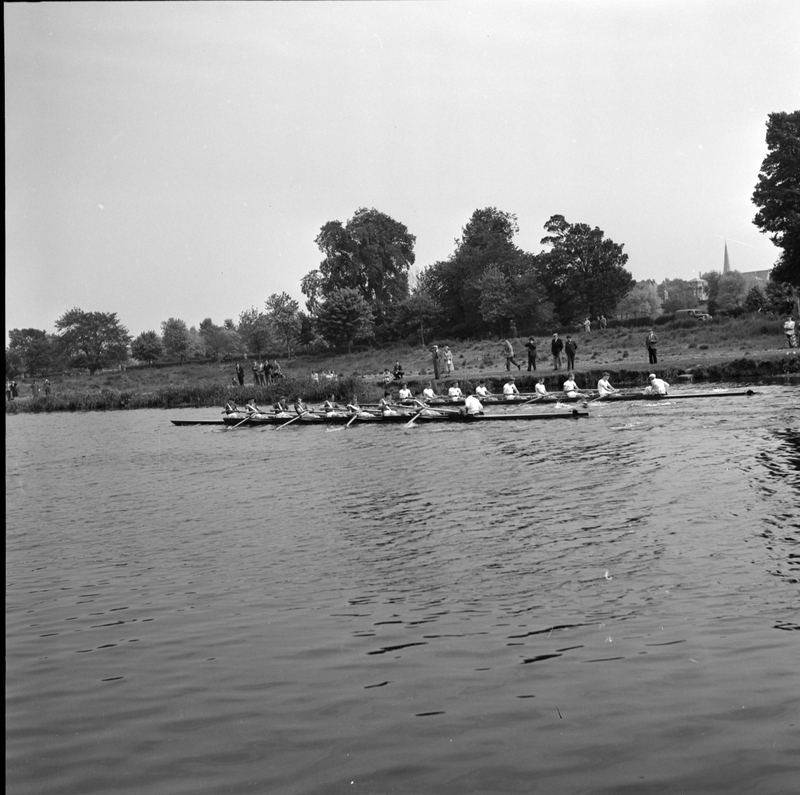 A sports scene with rowing featuring an eight oared boat race on the River Dodder at Rathfarnham in 1954. Morning Mary is surprised that there was a sufficiently wide part of the Dodder to accomodate it and a sufficiently long stretch (2000 metres) to enable a standard boat race. Who can throw some light on the matter? It looks like the Liffey at Islandbridge to me but I cannot account for all the buildings in the background. Some look like part of the Memorial Gardens and the spire looks a bit like one in Kilmainham/Inchicore but those on the left do not rhyme! [https://www.flickr.com/photos/swordscookie] Agreed - that spire looks like St. Judes. Looking at the OSI map, none of the buildings or houses near that spire survive - even the rest of the church is gone. The Irish Times of June 12th, 1954 refers to the previous day (the 11th) as being the Opening Day of the Dublin University (i.e. Trinity) Regatta at Islandbridge. The photographer is perhaps at the waterside in the Garda Boat Club, where Google's aerial view caught a crew taking to the water in a similar craft. Interestingly, the Garda Rowing Club website says they were founded on June 9th 1954, four days before this picture was taken. Janey mac! I always assumed that St. Judes church had burned down, but from the NIAH I learn: The church was sold by the Dublin Diocese in the 1980s and was demolished by Desmond Guinness in 1988, who removed the materials to Straffan, where its timbers and stained glass were used to decorate a steam-traction museum. What is unusual about this image is that it was taken a few months before I was born, but more astonishingly is the Photographer didn't pay any notice to the natural horizon, keeping it parallel to the upper or lower frame or didn't notice the leaning steeple. [https://www.flickr.com/photos/[email protected]] Great, thanks Derek.